Moderate speed, straight line exercise where students experience the dramatic weight transfer encountered during rapid direction changes. 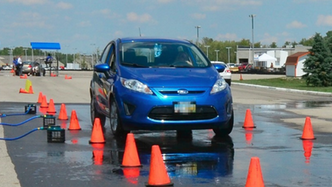 This drill trains students how to brake effectively under slippery conditions with a premium on car control and maintaining the ability to steer under heavy braking. 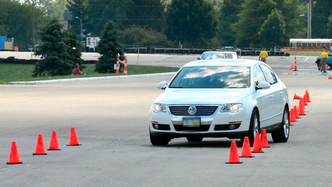 Simulating a highway or multi-lane moderate-speed collision avoidance situation, this drill trains students how to effectively use steering (instead of brakes) to avoid a crash. The lesson here is that maintaining chassis balance through smooth but deliberate driver inputs is even more critical at higher speeds. 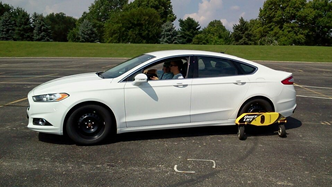 The Spin Avoidance Car uses a device called the Drift Lift to simulate limited traction in adverse weather conditions. The Drift Lift is smooth, quiet and totally out of view of the driver. This gives the Spin Avoidance Car all the required realism and dynamics while maintaining a safe and controlled environment in which to learn and train. 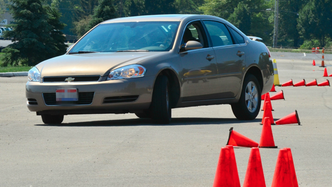 An instructor rides with each student as they drive the Spin Avoidance Car on a closed loop course.